Pro Se Productions, an innovative Genre Publisher, turned its attention to younger readers, bringing in fans under the age of eighteen, with the creation of their YOUNGPULP! imprint in 2013. The first series to debut in that line, COMPANION DRAGONS TALES, now debuts its third volume of exciting action packed tales. COPPER’S CHOICE by Nancy A. Hansen is now available in digital and print formats. When Nigel Gillette, renowned action/adventure author and wizard-at-large, wins a small dragon familiar in a magical game of chance, he is initially excited. Copper Dragon however, is not so thrilled. She has a shameful and abusive past, where she was trained harshly and used for illegal activities. Copper has serious trust issues, and so she refuses to believe that any human can be as friendly and generous as Nigel seems. She decides to strike out on her own, but quickly finds that the world is a cold and cruel place when you are only a small dragon who has always lived as a tame creature. So Copper has to make a choice. Should she return to the life of crime that she knows so well, or can she learn to trust this new human companion, who seems to have her best interests at heart? From the premiere chocolate producing world of Bulgosia to the famed magical resort island of Atlantis, Copper Dragon goes on a journey of self-discovery, meeting other fantastic creatures and getting into all sorts of difficult and sometimes dangerous situations. Along the way, she will learn not only to trust her own instincts, but to use those skills she has honed to her best advantage, in hopes of earning the life she deserves. Fly along with Copper in Nancy A. Hansen’s COMPANION DRAGONS TALES VOLUME THREE: COPPER’S CHOICE From Pro Se Productions and YoungPulp! 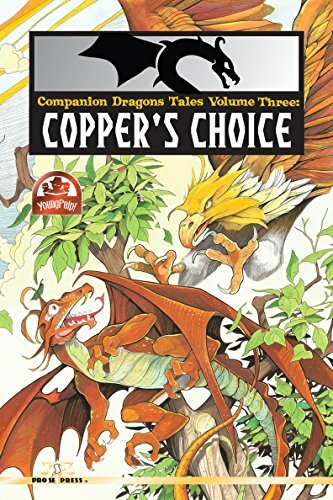 Featuring a fun and engaging cover by Michael Hegedus and cover design and print formatting by Antonino Lo Iacono, COMPANION DRAGONS TALES VOLUME THREE: COPPER’S CHOICE is available now at Amazon at https://www.amazon.com/Companion-Dragons-Tales-Three-Coppers/dp/1535011459/ref=sr_1_2?ie=UTF8&qid=1467648814&sr=8-2&keywords=copper%27s+choice+hansen and Pro Se’s own store at www.prose-press.com for 10.00. The third volume in the YoungPulp! series is also available as an Ebook, designed and formatted by Lo Iacono for only $2.99 for the Kindle at https://www.amazon.com/Coppers-Choice-Companion-Dragon-Tales-ebook/dp/B01HUDBHV0/ref=sr_1_1?ie=UTF8&qid=1467648993&sr=8-1&keywords=copper%27s+choice+hansen and for most digital formats via Smashwords at https://www.smashwords.com/books/view/647488.